In the next twelve days until November 1, it’s going to be important to be thinking about what we’re planning to write for our NaNo project—but if you’re following along with me for this prep, it’s also going to be important not to overthink it. I’ve already done a couple of First Draft in 60/90/120 Days in which I give detailed instructions for preplanning a novel project. We’re not going to go in depth with it this time. Again, I’ve already filled in some stuff about my characters in my story bible, because this is a story I’ve tried writing before—and because these characters were introduced in other stories as secondary characters. 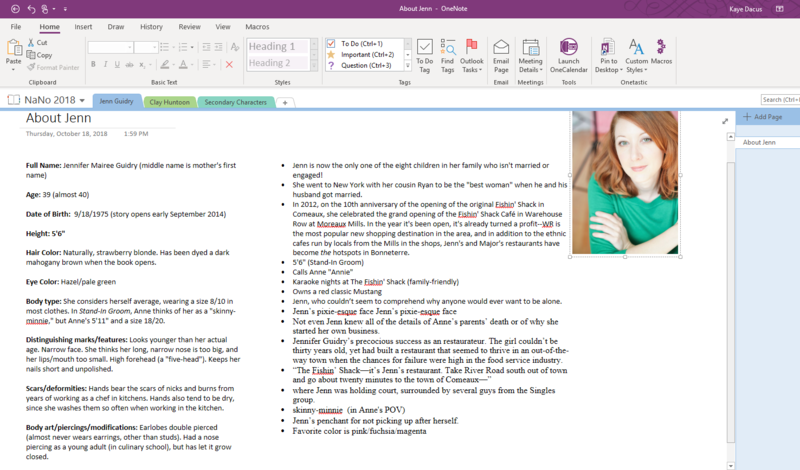 And while I don’t want to get caught up in trying to plan out the minutia of every detail of the main characters’ lives, backstories, goals, motivations, etc., I do at least need to make notes on what I do already know about them. Hair Color: Naturally, strawberry blonde. Has been dyed a dark mahogany brown when the book opens. Body type: She considers herself average, wearing a size 8/10 in most clothes. In Stand-In Groom, Anne thinks of her as a “skinny-minnie,” but Anne’s 5’11” and a size 18/20. Distinguishing marks/features: Looks younger than her actual age. Narrow face. She thinks her long, narrow nose is too big, and her lips/mouth too small. High forehead (a “five-head”). Keeps her nails short and unpolished. Scars/deformities: Hands bear the scars of nicks and burns from years of working as a chef in kitchens. Hands also tend to be dry, since she washes them so often when working in the kitchen. Body art/piercings/modifications: Earlobes double pierced (almost never wears earrings, other than studs). Had a nose piercing as a young adult (in culinary school), but has let it grow closed. Repetitive/habitual physical quirks: Has a hard time sitting still. Tends to be a little accident-prone outside of the kitchen. As I think about my characters and story over the next not-quite-two-weeks, I know I’ll be revising/changing some of this—I’m going to bump her birthday later, as turning 40 will play a role in the character arc I currently have simmering for her in the back of my mind. And I know that some other things will come up and/or change as I write the story—my characters always have surprises for me! For Clay, I don’t have the same kind of structured chart of information—just a list of things I know about him. And I’m going to leave it that way. Assignment 1: Add whatever you already know about your main character(s) to your story bible. Don’t spend too much time thinking about it—just jot down notes of what you already have in mind or have already created. Getting Your Characters into S.H.A.P.E. I’m usually a pantser and have never done any story planning beyond the absolute minimum – I look at things like this and am always impressed! I usually don’t know who my characters are or what the plot’s going to be until after I start just going for it, and sometimes I wish I could plan better. It’s a little easier for me. Because I write romance, I already have a basic structure around which to build a story. And I have to know the two main characters—otherwise, with romance, there is no story to start with. If I know those two characters and can figure out how they meet, then I have something to get me started writing. Don’t obsess over it too much—your characters will reveal a lot to you as you write and they have to interact with others and react/respond to conflict. I just find I spend a lot less time spinning my writing wheels by getting stuck inside their heads as they reveal their backstory and details to me after I’ve already started the story. It’s less that has to be revised out later!